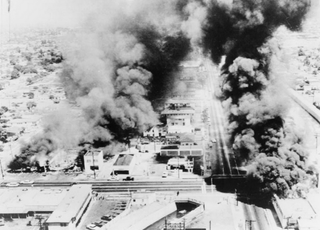 "Almost all of them are dead now," the Los Angeles Times' Doug Smith began his story Wednesday evaluating his paper's coverage of the Watts uprising of 1965. "When I joined The Times in 1970, they were the giants of the newsroom, still sharing the glow of the Pulitzer Prize for their coverage of the Watts riots five years earlier. "I'm not suggesting the work was unworthy. I read the stories with admiration for the reporters' newswriting skill and for the courage of many white reporters who headed into the conflict zone. "But as the coverage continued day after day, it became apparent how unprepared these journalists were to probe the complex social currents that ignited and fueled the upheaval. "Over the 11 days of riot coverage and initial follow-up, The Times' perspective evolved from objectivity to alarm to befuddlement as reporters struggled to comprehend a threat to their city from the sort of racial conflict that until then had largely been limited to America's southern and northeastern states. "I joined The Times soon enough after the riots to know that reporting of the time can't be judged by the standard that applies to an incident today in Ferguson, Mo., or Baltimore or Oakland that sizzles instantly across Twitter, Instagram and Snapchat as fragments form an unfiltered kaleidoscope of perspectives. Back then, we used pay phones to call in what we saw and editors in the downtown office shaped it into a singular voice — the voice of white Los Angeles. "It's easy to forget that the word was standard American usage in 1965. The Rev. Martin Luther King Jr. had used it in his 1963 'I Have a Dream' speech, and the terms 'black' or 'Afro-American,' preferred by leaders such as Malcolm X, were just beginning to gain traction. "The first day's coverage didn't strive for answers, but rather offered simple, tight description of what reporters could verify at the time. "On the second day, the fumbling began. . . ."
"So far this year, 24 unarmed black men have been shot and killed by police — one every nine days, according to a Washington Post database of fatal police shootings," Sandhya Somashekhar, Wesley Lowery and Keith L. Alexander reported for the Washington Post's Sunday print edition. "During a single two-week period in April, three unarmed black men were shot and killed. All three shootings were either captured on video or, in one case, broadcast live on local TV. "Those 24 cases constitute a surprisingly small fraction of the 585 people shot and killed by police through Friday evening, according to The Post database. Most of those killed were white or Hispanic, and the vast majority of victims of all races were armed. "However, black men accounted for 40 percent of the 60 unarmed deaths, even though they make up just 6 percent of the U.S. population. The Post's analysis shows that black men were seven times more likely than white men to die by police gunfire while unarmed. "The latest such shooting occurred Friday, claiming Christian Taylor, 19, a promising defensive back on the Angelo State University football team. Police said Taylor crashed an SUV through the front window of a car dealership in Arlington, Tex., and was shot in an altercation with responding officers. The case is under investigation. "The disproportionate number of unarmed black men in the body count helps explain why outrage continues to simmer a year after Ferguson — and why shootings that might have been ignored in the past are now coming under fresh public and legal scrutiny. . . ."
Charles M. Blow, New York Times: 'Black Lives Matter' and the G.O.P. Cincinnati media outlets are seeking the police dashcam video at the scene of the slaying of Officer Sonny Kim, but the prosecutor is resisting its release and urging the public to boycott sponsors or cancel subscriptions of the media outlets to show their disapproval. At least two of the outlets, the Cincinnati Enquirer and WCPO-TV, have explained to readers and viewers why they say they should be able to view it. Kim's family has requested that the video be kept out of the public eye. WCPO reported, "The Cincinnati police dashcam video at the scene of Officer Sonny Kim's death is now in the hands of Hamilton County Prosecutor Joe Deters — and if he has it his way, that's where it will stay. "If the Supreme Court of Ohio says it is a public record — which I think would be horribly wrong — then we would have no choice (but to release it)," Deters said in an interview on 700 WLW Tuesday. 'But until that happens or until a common pleas judge orders it released, we're not going to release it.' . . ."
The report aired audio of Deters urging radio listeners to "boycott the media outlets asking for the video. People have to express their outrage at any media outlet that would air this video, and the way you express your outrage is to cancel subscriptions, you deluge the sponsors, people who buy ads, whether it's TV or radio or a newspaper. That will have more effect than any court or any prosecutor." WXIX-TV, a Fox affiliate, said, "FOX19 NOW maintains that Sonny Kim is undoubtedly a hero. Should the video be released, members of our news team would examine and compare it with police and witness accounts from the day he was killed. We fully respect the wishes of the Kim family, and plan to honor them. . . ."
The Enquirer wrote Tuesday that unanswered questions remain. "We have not yet seen the video, and no decision has been made to post it to Cincinnati.com," Rick Green, president and publisher, and Michael M McCarter, interim editor, wrote. "The right to review it does not signal a desire to share it. We will be responsible and sensitive in how we proceed. "Like so many in Cincinnati, we salute Officer Kim's service and mourn his passing. "Our request to review all public records related to the case stems from our responsibility to seek the truth and tell the complete story, not to proceed in a reckless, sensational manner. "We will carefully balance its newsworthiness with our desire to respect community sensitivities and the Kim family’s loss. . . ."
"A recent New York Times Magazine article on the last 50 years of the Voting Rights Act got a response from a very powerful person — President Obama, Rebecca Kaplan reported Wednesday for CBS News. "Mr. Obama penned a letter to the editor published Wednesday saying the article demonstrates the need to restore the landmark 1965 legislation, which was partially gutted by the Supreme Court in 2013.
" 'From the moment the ink was dry on the Voting Rights Act, there has been a concentrated effort to undermine this historic law and turn back the clock on its progress,' Mr. Obama wrote. Reporter Jim Rutenberg's article, he continued, 'puts the recent push to restrict Americans' voting rights in its proper context. "One of the women mentioned in the article is Rosanell Eaton, who was one of the first black voters to register to vote in her North Carolina county in 1939. Now, at age 94, Eaton is one of the plaintiffs in a civil suit challenging a 2013 law passed in North Carolina that cut back the early voting period in half (including two Sundays when black churches ran voting drives), ended same-day voter registration and said student IDs could not be used as identification at the polls. "I am where I am today only because men and women like Rosanell Eaton refused to accept anything less than a full measure of equality . . ."
Julian Rodriguez, a lecturer at the University of Texas at Arlington, has been chosen as the 2015 recipient of the Barry Bingham Sr. Fellowship,which recognizes an educator's outstanding efforts to encourage and mentor college students of color in the field of journalism, the Association of Opinion Journalists has announced. "We are thrilled to make this award to such a deserving recipient," David D. Haynes, editorial page editor of the Milwaukee Journal Sentinel and AOJ president, said in a news release. "Julian Rodriguez is doing the good work every day of molding journalists in their native language. We're proud to be able to recognize his work." "Today dozens of Spanish speaking college students are graduating with journalism degrees and are prepared to take jobs in Spanish-language media because of Julian Rodriguez. This professor at University of Texas at Arlington (UTA) realized there was a need to teach broadcast news in Spanish and he made it happen. "Rodriguez is the only fully bilingual Hispanic faculty member in the Department of Communication at UTA. He's the founder and news director of UTA News en Español (UTANE), a Spanish-language television newscast produced in the television studios of the Department of Communication at UTA. Rodriguez and his students have been producing original newscasts since 2010. "Rodriguez's selection recognizes the importance of training journalists for the Spanish-language media, the preference of the majority of what is now the nation's largest minority group. . . ."
Visit to Prince Studio Was Possible "Memory of a Lifetime"
Bob Butler's term as president of the National Association of Black Journalists ended over the weekend with a dance party for NABJ convention attendees at the Paisley Park studios of the rock icon Prince. The entertainer did not perform, as many were hoping, but Butler said Wednesday that he was guided by this thought as he made his decision to participate: "What price do you put on giving our members a memory of a lifetime?" Butler made his comments in a Facebook posting. NABJ members paid $20 each to enter Paisley Park (members of the general public paid $50), and bus rentals cost NABJ about $10,000, according to Executive Director Darryl R. Matthews. Since then, members have passionately taken sides on whether the evening provided the "memory of a lifetime" or something else. "As many of you know, I have served as president of the National Association of Black Journalists (NABJ) since 2013. Our 40th anniversary convention was held in Minneapolis August 5-9. I received a call on Wednesday inviting our convention attendees to a dance party Saturday night at Paisley Park. More than 650 people signed up to take buses out to PRINCE'S house. "Saturday afternoon I received another call saying Prince wanted to have a private conversation with a small group of NABJ members. I had no idea what he wanted to discuss but, as you can imagine, there would have been no shortage of people wanting to be included. It was a tough call but ten of us were escorted to his private studio. After shaking hands he had us taken to a conference room upstairs. "One of the first things he did was apologize for not being able to play because his band was on vacation. He did say the 'next time we'd do it right.' We then talked for about 45 minutes about the music industry and how it takes advantage of young musicians. This piece by Eric Deggans sums up our meeting. "After dancing for about two hours, our members were treated to a short appearance during which Prince talked about his new collaboration with Jay Z and asked us to buy his new album 'HitNRun,' which is being released next month on Jay Z's new streaming service, Tidal. "I handed the gavel to new president Sarah J. Glover, who was also in the meeting, on Sunday but that was a heck of a way to end my presidency." Chandra Thomas Whitfield, NBCBLK: The No Show: How Prince Made Hundreds of Black Journalists "Cry"
"Carolina Garcia, managing editor for enterprise and projects for the Los Angeles Newspaper Group's nine publications, told staffers Tuesday she will retire at the end of the month," David Montero reported Tuesday for the Los Angeles Daily News. Garcia is the first Latina to be named as the leader of a major market English-language daily newspaper in the United States. "The departure marks the end of a career in journalism that spanned more than three decades and in three states — nearly half of that time in California," Montero wrote. "The 61-year-old joined the organization in 2008, taking over as senior editor of the Los Angeles Daily News — LANG's flagship paper — after the departure of Editor Ron Kaye. She came to LANG from the Monterey Herald, where as editor she led it to being named best newspaper in 2002 at the California Newspaper Publishers Association’s annual contest. "In her seven years with LANG, she led a series of award-winning projects that included a 51-page magazine report on California’s drought and a special section two years ago about the dying town of Hinkley made famous by activist Erin Brockovich. . . ."
"A California judge has made short order of a $20 billion lawsuit that accused Comcast and Time Warner Cable of racial discriminating through the licensing of cable channels," Eriq Gardner reported Friday for the Hollywood Reporter. "The legal action, spearheaded in part by Byron Allen's Entertainment Studios Networks, gained some notoriety for including as co-defendants Al Sharpton, the NAACP, the National Urban League and the National Action Network for allegedly facilitating discrimination. In 2010, Comcast acquired NBCUniversal and entered into voluntary diversity agreements with these groups. The lawsuit said it was a 'sham, undertaken to whitewash Comcast's discriminatory business practices,' and raised hackles over Sharpton's salary as host of an MSNBC show. "Today, U.S. District Judge Terry Hatter Jr. agreed, and in a sign he didn't even think this was a close call, spent just three pages analyzing the claims in an order to dismiss. . . ."
"Mariah Stewart, Huffington Post's Ferguson reporter, has spent much of the past year chronicling the structural inequities affecting the city and its surrounding communities," Jean Marie Brown wrote Wednesday for all digitocracy.org. "But as her one-year crowdfunded appointment draws to a close, there's still uncertainty about whether Stewart will still have a job come September. . . ."
"A new study has found greater racial and gender diversity among subjects and creators of independent documentaries on public TV compared to their counterparts on other PBS shows and in independent commercial docs," Henry Schneider reported Wednesday for Current.org. "The study, which examined 165 films that aired on national cable and public television in 2014 . . . found that PBS's Independent Lens and POV featured more than twice as many minority directors as documentary series on HBO and CNN — 33 percent, compared to 14 percent — and involved more female directors — 46 percent, compared to 37 percent. . . ."
"Fifty-three journalism and open government groups today called on President Barack Obama – yet again – to stop practices in federal agencies that prevent important information from getting to the public," the Society of Professional Journalists said Tuesday. "The national organizations sent a letter to Obama Monday urging changes to policies that constrict information flow to the public, including prohibiting journalists from communicating with staff without going through public information offices, requiring government PIOs to vet interview questions and monitoring interviews between journalists and sources. . . ."
"Former Clippers owner Donald Sterling has filed a lawsuit against TMZ and former friend V. Stiviano over leaked recordings in which Sterling made racially charged remarks that led to him being stripped of his ownership of the Clippers," Stephen Ceasar reported Monday for the Los Angeles Times. "The lawsuit, filed last week, alleges that Stiviano recorded a phone conversation with Sterling in September 2013 and that she or an associate provided the 'illicitly' recorded conversation to TMZ in violation of Sterling's right to privacy. Sterling contends in the suit that he did not know that Stiviano regularly recorded their conversations. . . ."
"Longtime television news anchor J.C. Hayward was dismissed from a high-profile charter school lawsuit Tuesday, releasing her from allegations that she was involved in financial mismanagement at a District school for troubled teens," Michael Alison Chandler reported Tuesday for the Washington Post. She also wrote, "Hayward retired from WUSA in January after four decades on the air. She had been on hiatus since late 2013, when she was placed on leave pending an investigation into the Options allegations. . . ."
"Armstrong Williams, chairman of Howard Stirk Holdings Journalism Foundation, Inc. and Coastal Carolina University today announced an agreement under which the foundation will sponsor Armstrong Williams Media Interns with an initial commitment of $50,000,"scnow.com reported from Conway, S.C. on Monday. " . . . Williams said media Interns provides an optimal platform for introducing college students from disadvantaged backgrounds to careers in journalism and broadcast media, which has traditionally failed to expose a broad cross-section of America’s young people to opportunities in the field. . . ."
The National Association of Hispanic Journalists will honor the ESPN One Nación with the NAHJ Presidential Award of Excellence, the association announced Aug. 5. It said in an announcement, "The initiative brings teams from English and Spanish language networks together to showcase and produce stories about Latinos providing our community greater visibility across all platforms. It also celebrates culture, discusses social issues and highlights achievements on and off the playing field." Anna Lopez Buck, whose departure as executive director of the National Association of Hispanic Journalists was announced May 27, has joined the National League of Cities as program director, membership constituency groups, according to the organization's website. The Asian American Journalists Association opened its annual convention at the Hyatt Regency Hotel in San Francisco Wednesday. Executive Director Kathy Chow said 850 people, including sponsors and guests, are expected. "A Native American tribe from South Dakota will return a $25,000 donation from a charitable arm of the NFL's Washington Redskins, saying the team name is 'derogatory and inappropriate', " Kevin Burbach reported Aug. 7 for the Associated Press. "The tribal council of the Cheyenne River Sioux Tribe voted Wednesday to return the check, which was issued last month by the Washington Redskins' Original Americans Foundation to the tribe's rodeo association. . . ."
"One suspect has been detained for the quintuple murder of Mexico City's Colonia Narvarte in which graphic journalist Rubén Espinosa Becerril died," Los Angeles-based La Opinión said in an Aug. 7 editorial. "He had arrived there from Veracruz fearing for his life, claiming threats from governor Javier Duarte de Ochoa. As in other similar cases in this country, there are doubts that the crime investigation is really searching for the perpetrators, or is it only a maneuver to respond to popular outrage towards the crime, in which individuals plead guilty after being tortured." The editorial also said, "In this crime, all roads seem to lead to Veracruz: either its government, the drug dealers, or both. . . ."